The focus on industrial products makes GE a more stable company and a better dividend stock for investors. Eight years ago, the financial crisis nearly toppled industrial giant General Electric (NYSE:GE), and the finance business that had become a growing part of the company was revealed for the risk center that it really was. Investors who had bought the company as a stable source of dividends experienced a shock to their investment after decades of consistent dividend growth. 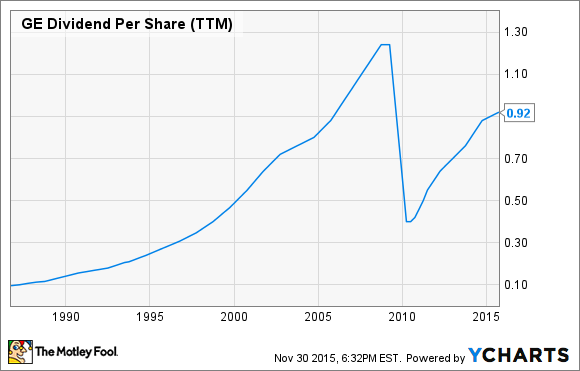 GE Dividend Per Share (TTM) data by YCharts. The reaction by GE's management was to sell off much of its finance business, GE Capital, in an effort to have more stability long-term. That process has taken years, but with billions in asset sales now complete, the company is very different than it was going into the financial crisis. What's left should be a more focused company that generates consistent results in more traditional industrial lines of business. And that should put GE back on track toward the 25-year dividend-raising streak required to be a Dividend Aristocrat once again. Lighting has always been a big part of GE, and now it's taking a more prominent role. Image: General Electric. GE has already sold $126 billion in financial assets as part of its strategy shift. One of the biggest was the recently announced final exchange ratio of its Synchrony Financial (NYSE:SYF) position of 1 share of GE for 1.0505 shares of Synchrony Financial. Once the full transaction is completed, the exchange could reduce the total number of shares outstanding by about 6.6%. This makes for a smaller company as a whole, but a more focused company on the industrial businesses where GE has a true advantage. GE may not be a household name outside lighting products, but the company makes some of the products that make the world as we know it run. It has a major share of the jet engine market, builds turbines for power plants, makes large medical equipment, is involved in oil and gas products, and even has a big transportation business. In the third quarter, industrial operations generated $2.57 billion in earnings, or $0.25 per share. Even without any earnings contribution from GE Capital, the company is very profitable, and that's during challenging market conditions for the oil and gas business. Organic revenues were up 4% in the third quarter to $26.2 billion, and segment profit for industrial segments were up 9% organically, driven by transportation and lighting. There's also a $270 billion backlog for the company to fall back on, one of the benefits of being in long-term capital cycle businesses like aviation and energy. Backlog has grown 5.5% over the past year alone, despite the near collapse of the oil and gas industry in that time. While GE remains a complex business overall, its risks are much simpler to understand now that it's jettisoning most of its financial business. In simple terms, it's leveraging industry-leading technology in turbines and one-stop shopping in industrial applications like energy and water to provide value to customers. For energy customers, it's offering everything from smart meters and lighting for consumers to efficient power plants for utilities and everything in between. This makes it a go-to supplier for the industry, and the $14 billion acquisition of Alstom's power business is another sign of that focus. With energy rapidly changing as sources such as wind -- where GE is a leading turbine manufacturer -- and solar take a larger share of the market, GE will be in a position to supply the infrastructure for the next generation of the grid. Aviation is another industry where GE is able to leverage its turbine expertise into financial success. The aviation business is $142 billion of the company's backlog and has grown 24% over the past two years. Between GE and joint venture CFM (which GE owns 50/50 with Snecma), the company has over 50% market share across a variety of sizes of aircraft around the world. If you're building a commercial aircraft, chances are you're considering a GE engine. Water is a business that GE sees as a next-generation one-stop-shopping experience for its customers. Water treatment and filtration are businesses that are growing in importance today, and over the coming decades, desalination plants may grow in importance as well. With billions of people around the world looking for better access to this resource, this could be the next big business for GE. For decades, GE has become a more and more complex business with less and less focus on the industrial products that made it a power in the first place. But today it's returning to its roots, and I think the focus on big industrial opportunities where it can add value will pay off long-term. Over the past year, the industrial business has generated $1.04 per share in earnings, and that's despite a very weak oil and gas industry. If we value this segment of the business alone, it would leave GE's stock with an earnings multiple of 29 and also cover the company's $0.92-per-share annual dividend. Add in the buybacks from the Synchrony deal, and the earnings multiple falls to 27.7. With leadership positions in highly necessary industrial businesses that GE is now focused on, GE and its 4% dividend yield and steadily increasing dividends are a great value for investors today. And I think management will be able to leverage its renewed focus into higher earnings growth in the future. After years of turmoil, GE is on its way to becoming a Dividend Aristocrat once again, and investors should no longer overlook it.